Comments: Battle Droids are produced in massive foundries on Geonosis. Despite a treaty forbidding the expansion of those armies, Geonosian foundries are currently running at maximum capacity, with thousands more battle droids secretly massing on Geonosis. Destroyer Droids, also known as droidekas, are engineered specifically as mobile machines of destruction, capable of eliminating practically any opposition. They roll into battle in the shape of a wheel, then unfold to full-standing combat stance for assault. 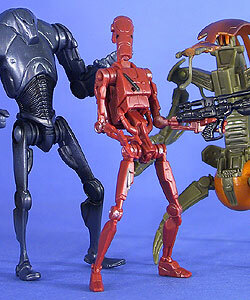 Super Battle Droids operate independently rather than in groups, making them stronger, more efficient models of technological weaponry.